Voravat Tantranont, (centre), with some of the ‘local celebs’ who will become fashion models for the ‘Dazzling Beautiful’ concept. Robinson Chiang Mai in July is once again hosting its annual party event, “The Shopping Paradise at Robinson Chiang Mai.” The fashion giants ICC International Co., Ltd., and The Alga Group, Co., Ltd., have joined together with Robinson Chiang Mai to showcase the most modern fashions available. The latest accessories, leather ware, handbags, men and women’s fashions, children’s goods, and housewares will be presented along with exclusive sale discounts, trading options and “give-away” promotions. As an added bonus to customers, over 100 of Chiang Mai’s finest personalities will be in attendance over the course of the event. Decorated with the theme “4 Concepts in 4 Days”, over 30 celebrities will be on hand to join in the daily highlight shows over the course of the event. Activities will be held over four days, starting from July 17 to 20, 2008, only at Chiang Mai’s fashionable retail outlet, Robinson Chiang Mai. Local bands compete for cash and chances! of the JJ Markets Talent Contest. Students from around the world descend on Chiang Mai International School. Last week, Chiang Mai International School hosted the 10th Holiday Bible Club, themed this year as ‘Go for Gold’, an appropriate title considering this is the year of the Olympics. The four-day event concentrated on team sports and team activities rather than individual goals, and was held from June 16-20. 180 kids from around the world, together with students from local schools including Grace, NIS, Nakornpayap, Lanna and CMIS itself took part, as well as some “home school” children. 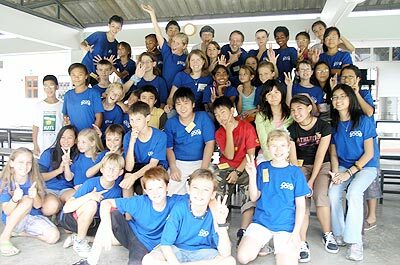 70 volunteers and coordinators including the ‘Youth For Christ’ team from the USA and New Zealand worked for many long hours to put it all together; the event was organised locally by the Chiang Mai Community Church along with Catherine Erpen, elementary coordinator at CMIS. Each day began at 9 am in the Auditorium, with the singing of popular songs and hymns accompanied by a live band, after which students were divided into 3 teams depending on their grade level. Activities throughout the morning included a drama play about King David - a light hearted yet sincere look at the life of one of the best-known characters in the Bible, which was organised by Jenny McKechnie. Kat Cougill supervised the painting of stones and treasure boxes and team games were arranged by Kate Reinke. The morning’s activities were rounded off with Scott Cougill’s “spotlight”, showing how every activity is connected, followed by yet more singing and lunch. Should anyone wish to know more, or to join in next year, they should contact [email protected] .com or the CMCC Office above the Raintree Centre in Chiang Mai. This year, the USA Consulate in Chiang Mai together with the Veterans of Foreign Wars Post 12074 will celebrate the “4th of July” one day early, on July 3, and invite all USA citizens in CM to join them and enjoy a variety of good ol’ American food, drinks and fireworks. All American guests must show a U.S. passport or its photocopy on entry; admission is 50 baht per person with kids 12 and under (also with passport or its copy) free. US Citizens may invite two non-US guests, who must arrive with their American host, by pre-arrangement with the Consulate. Please contact [email protected] prior to June 29 for further details and permission. An email confirmation will be sent, which should be shown at the entry gate together with guests’ photo-id. The public gate, located across from the Municipal Office, will open at 4 pm, with no further admissions after 7 pm. Guests are requested not to bring bulky items such as backpacks and coolers and should note that there is no parking available at the Consulate. For more information, please call 053 252 629, (recorded announcement), or visit www.chiangmai.usconsulate.gov. Recently, three Grade 5 students from Prem Tinsulanonda International School proudly handed over the proceeds from a “Read to Feed” read-a-thon which they had organized as part of their Grade 5 Exhibition inquiry project on the right of all children to quality education. The project was aimed at raising money for the Heifer Project International’s Thailand initiatives, and involved the students gathering sponsorship for each book they planned to read over a five week period, a fun way of helping a great cause. Prem’s grade 5 students present the 25000 baht raised by the read-a-thon. Pramote Eua-amnuay, Director of Heifer Project International Thailand and Dr. Boonlom, president of its affiliated Gifts for Life Foundation, visited Prem to receive the 25,000 baht raised by the students from Grades 3 to 5. The money will support the organization’s projects in Northern Thailand by purchasing animals for families to raise and breed, with the resultant offspring then being given to another family in the village, thereby sharing the original gift and providing ongoing additional income which can be used to help meet education-related expenses. The much loved Chiang Mai concert pianist Bennett Lerner is now presenting his long-awaited series of 7 concerts featuring works by the famous French composer Gabriel Faure (1845-1924), and his contemporaries Mahler, Debussy and Ravel. A selection of Brahms’ chamber music will also be included. Guest performers will include violinist Tasana Nagavajara, tenor Jan-Ate Stobbe, mezzo-sopranos Sheilagh Angpiroj and Magdalena Pattianakotta, harpist Judi Utley, flutist Suratachai Chenyavanit, cellist Apichai Leamthong, and pianist Remi Namtep. The concerts will take place quarterly at Payap University’s newly renovated Saisuree Chutikul Music Hall, formerly the multi-media studio, and began on June 21, with a recital of works by Faure, Tchaikovsky, Chabrier, and Brahms featuring both Bennett and the violinist Tasana Nagavajara. During the series, Bennett will perform Faure’s complete Nocturnes and Barcarolles, a lesser known and rarely performed gem of the composer’s genius. For further information about concert dates and times, please call 081 950 9620, or watch out for announcements in this newspaper. Tickets are 200 baht, available at the door. Australian Honorary Consul Michael Walther, Chris Panasbad, MD of CP & Co International, Deputy Governor Tan Chumporn Sangmanee, Australian Trade Commisioner Jennie Lloyd and Pip Porntip Panasbodi, director of CP Australia and New Zealand Centre, pictured performing the opening ceremony. Last week, on June 16, the new CP Australia and New Zealand Centre located at Chiang Mai 89 Plaza, Chiang Mai - Lamphun Road, was opened by Deputy Governor Tan Chumporn Sangmanee. Honoured guests included Australian Honorary Consul Michael Walther, and Australian Trade Commissioner Jennie Lloyd, along with the Chancellor of Payap University and numerous representatives of the world of academia in Chiang Mai. In his speech, the Deputy Governor confirmed that not only should Chiang Mai be considered a tourist destination, but also a great educational centre from which students often continue their education abroad. Jennie Lloyd added to this by confirming that over 20,000 Thai students are currently receiving further education in Australia, and that Thailand is number four in the list of foreign students. CP Australia and New Zealand Centres currently deal with over 100 educational facilities in Australia, and many of the alumni continue in the Thai diplomatic and business world. Director Pip Porntip Panasbodi, herself tri-lingual, emphasised the importance of language and being able to converse in English and Chinese. The occasion followed a busy weekend which included the ‘Study in Australia and New Zealand with CP Education Expo’ which was held on Saturday June 14 at Central Ladprao in Bangkok and also at the Holiday Inn Chiang Mai on Sunday June 15. Over 30 Australian and New Zealand institutions jointly participated in both events. The MC of the event was Karen Panasbodi, herself a second year undergraduate student studying at the University of Technology in Australia, who explained the name of the business by informing attendees that “since 1997 the company culture has been built on the foundation of caring and professionalism and hence the company name reflects as such”. 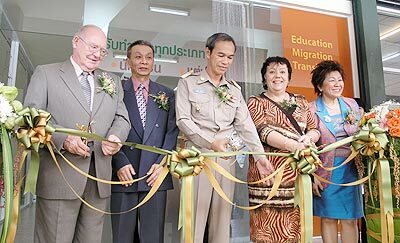 With offices in Silom Road, Bangkok since July 2002, CP Australia and New Zealand Centre provides one-stop professional, accredited educational, migration and language services for students, parents, teachers and the general public. For further information, please visit www. cpinter.com.au or email kiwi @cpinter.co.th. If you are planning a special event - why not invite [email protected]? Looks like Senator Obama has quite a few voters in Chiang Mai! Gary Suwannarat, Asia-Pacific Regional Vice-Chair of Democrats Abroad, indicated that large numbers of Americans are “disenfranchised because they do not know their rights or the process of registration. We’re here to assist with both.” Suwannarat indicated that overseas ballots were important in cementing the margins of victory for Senators Webb in Virginia and Tester in Montana in 2006, handing control of the US Senate to the Democratic Party. Democrats Abroad has developed and maintains www.VoteFromAbroad.org, an online tool which guides U.S. voters living abroad through the process of requesting their absentee ballot - simplifying a process which can otherwise be long and complicated with many potential pitfalls along the way. VoteFromAbroad.org is the easiest and most comprehensive online solution to the complexities of overseas voting. It is provided as a public service by the organisation for the use of all overseas voters, regardless of party affiliation. Founded in 1964, the organisation is the official overseas branch of the Democratic Party of the United States, and is recognized and seated as the equivalent of a State Party within the Democratic National Committee, holding 8 positions on the DNC and sending a voting delegation to the Democratic National Convention to choose the Democratic Party’s presidential candidate. Its members are US citizens living temporarily or permanently outside the United States in 43 recognized Country Committees, plus individual members in more than 160 countries around the globe. 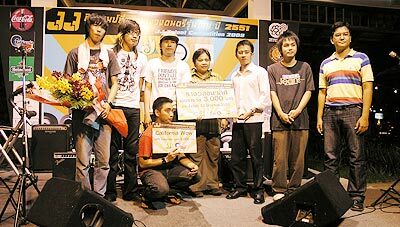 In Thailand, large and active chapters operate in Bangkok as well as Chiang Mai, with additional chapters set to emerge in 2008 in the north east and the eastern seaboard.